Immigration talk and politicos crowded Denver's annual Cesar Chavez Day celebration - Denverite, the Denver site! It was not lost on attendees that Gov. Polis’ speech came on the heels of policy talk that disappointed some in the Chicano movement. Mar. 31, 2019, 4:25 p.m.
Denver’s annual Cesar Chavez Day celebration is the place to go if you want the Chicano vote. That much was clear on Saturday at Su Teatro on Santa Fe Drive, where the community gathered to celebrate Chavez’s legacy — inside, at least, since inclement weather was cause to cancel the usual parade. Before Denver band Los Mocochetes began to play, beckoning the crowd into the theater, crowds mingled outside eating breakfast burritos and perusing a host of booths set up nearby. Many in the mass of people were elected officials or candidates. Over the course of the event, one may have caught sight of Mayor Michael Hancock and his opponents Jamie Giellis, Kalyn Rose Heffernan and Lisa Calderón, U.S. House candidate and former Speaker of the State House Crisanta Duran, City Council hopefuls Candi CdeBaca, Victoria Aguilar and Veronica Barela, At-Large Councilwoman Debbie Ortega, state Rep. Adrienne Benavidez and state Sen. Julie Gonzales, to name a few. Gov. Jared Polis was also in attendance and made, perhaps, the most prominent appearance when activist and Chicano studies Professor Ramon Del Castillo quieted the room so Polis could address the crowd. But Polis’ address came at a potentially awkward moment. Some immigrants’ rights activists have expressed concern that the Democrat has not been as progressive as they’d hoped on their issues. The governor declined to answer any questions on his way out, but others in the room shared their perspectives. To be clear, activists within the Chicano movement kindled by Cesar Chavez, Corky Gonzales and others are not uniformly on the same page when it comes to immigration matters. Diego Florez, a member of Los Mocochetes, told Denverite there are Chicanos who don’t see themselves as related to migrants, especially those who have long histories in a place like Colorado that predate U.S. annexation of the land. Some fear the same things as people outside the movement: that uncontrolled migration could affect opportunities to work. Immigration is a big issue for him, personally. His mother was deported to Mexico “six or seven” years ago, and he’s all-in to help people with deportation hanging over their heads. Sen. Julie Gonzales said it’s important to see nuance. “Immigration is an issue that doesn’t only affect Latinos, and Latinos care about issues other than immigration,” she said. Gianella Millan, a law clerk for the immigration-focused Meyer Law Office, said migrants’ rights were at the core of Chavez’s movement. Millan said she was “really disappointed” when she learned the governor was not taking hard progressive stances on immigration. She worked and volunteered on his campaign. She still likes him, and was glad to see him present Saturday morning — “He’s a homie,” she said — but she hopes he’ll come around on this issue. Politicians, generally, find themselves “against a wall” without any easy or clear-cut options, she said. But she feels they need to make hard choices. Candi CdeBaca, a candidate for the District 9 City Council seat currently held by Albus Brooks, felt like political representation was ratcheted up on Saturday. She was not surprised to see Polis in the room and echoed Millan’s recognition that politicians sometimes have to toe a line, though with more cynicism. Ramon Del Castillo said immigration has long been a spotlight issue for Cesar Chavez day in Denver. 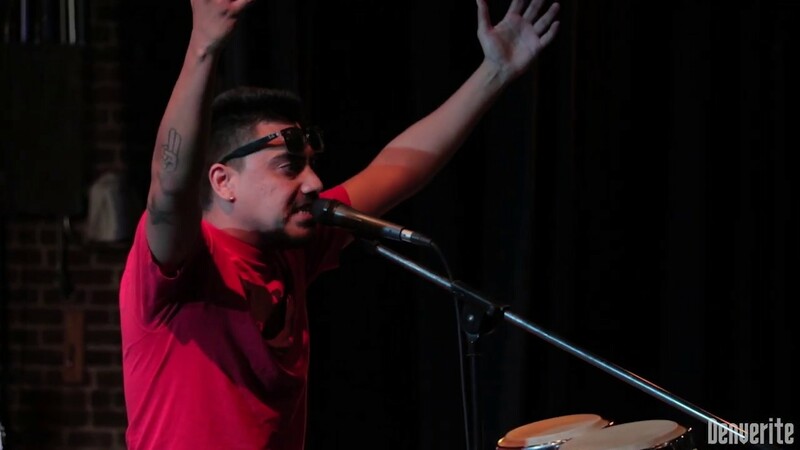 Even this year, Los Mocachetes introduced a song dedicated to migrants. Castillo cautioned against judging the governor on his immigration record thus far. In our society, we tend to think of things in “dialectics,” he said, where there are always “two opposing forces.” This is not the kind of discourse he’d like to see. He said that immigration is the most important statewide issue for him at the moment, and added he expects he and other Chicano and immigration advocates will have the governor’s ear moving forward. Their community is too important to ignore. State Sen. Julie Gonzales arrived after the governor’s appearance, so she didn’t comment directly on his speech or policy. But with so many candidates and politicians in the house, she did have a community perspective to share.